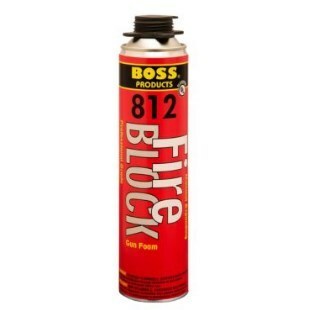 Fire Block Foam Straw Grade; Quantity 12 Ounce; Container Type Bottle; Approval UL, ISO, NFPA; Color Red; Temperature Rating -40 to 200 Deg F (Service), 40 to 115 Deg F (Application); Material Specification ASTM E-84BOSS® 812 Fire Block Foam prevents the spread of smoke and toxic gasses from one compartment to another, thereby slowing down the spread of fire, due to lack of air to fuel the flames. BOSS® 812 has excellent insulation and acoustic properties and is also paintable (after inspection). BOSS® 812 has been tested to ASTM E-84 and UL 723.